This post is part of a series called Android User Interface Design. Before we get started, let's define what a Fragment is, at a high level. A Fragment is, generally, a chunk of user interface with its own life cycle. If that sounds a lot like an Activity, that's because it is a lot like an Activity. However, a Fragment is different from an Activity, in that a Fragment must exist within an Activity. A Fragment doesn't have to be paired with the same Activity each time it's instantiated, which gives it some flexibility. Also like an Activity, a Fragment need not contain any user interface. This tutorial assumes you will start where our ListView tutorial left off. You can download that code and build from there, though you will have some tasks you'll have to do unassisted, or you can download the code for this tutorial and follow along. This workflow works fine on a relatively small phone screen. However, on a large screen, like the 10" screen of the Motorola Xoom, and there's a lot of wasted space on the ListView screen. The WebView screen looks fine, if a bit boring. Now that we know how the new screen workflow will be designed, we also know that the two current activities will need to be converted to fragments. We'll do the conversion in several steps. The first step involves leaving the screens visually unchanged, but modifying each screen to use a fragment. One fragment will contain the current ListView and another will contain the WebView. Then we'll switch to a single screen implementation, which involves modifying the messaging between the ListView and WebView activities-turned-fragments. First, though, change the Project Build Target of your application to Android 3.0. To do this from within Eclipse, right-click on the project and choose Properties. Navigate to the Android section and check the checkbox next to Android 3.0. We're not using any Google APIs, so the Android Open Source Project version is sufficient. Then click the OK button. Now you'll have access to the new APIs, including the Fragments API. Note: In a future tutorial, we'll talk about using the new compatibility layer to enable technologies like the Fragment API to work on earlier versions of Android. For now, though, they will require a device with Android 3.0, Honeycomb. Create two new Java classes to represent the two fragments: the ListView and the WebView screens. Name them TutListFragment and TutViewerFragment. TutListFragment will extend the ListFragment class and TutViewerFragment will just extend the Fragment class. The ability to access the activity instance directly is useful, but will create a problem later on. What if this fragment is on the screen with the list fragment? In that scenario, there will be no launching Intent to get the URL from. Similarly, in TutListFragment, we launch a new Activity directly whenever the user clicks an item in the list. What if the TutViewFragment existed within the same activity? If so, launching a new activity would make no sense.We'll return to resolve these issues later in this tutorial. Now create a new layout file called tutlist_fragment.xml to represent the Fragment containing the list of articles. A Fragment layout resource uses the tag and references the Fragment class you created. Also, of note, the TutListActivity should inherit from the Activity class, not ListActivity. Try running the application now. You'll note that it does exactly what it used to do. Not very exciting yet, is it? However, the entire user interface is now run using fragments. This will allow the next changes you need to make to go smoothly as we add a new layout to combine the two fragments for larger displays to show to the user on a single screen. However, as you may have noticed, the communication between fragments is handled identically to how we communicate between activities. In fact, we used the knowledge that the activity each fragment was paired with remained unchanged. This will not be the case when we have a single activity that contains and manages both fragments. Let's fix this first. As you learned in Step 3, launching an activity directly from the TutListFragment object doesn't make sense any longer. The WebView UI may, in fact, be part of the same activity as the List—that’s our plan anyway for larger screens. In that case, we just want to update the URL of the WebView in the second fragment. So now we have the functionality split up between the fragment, which handles the user interface actions, and the activity, which can be a controller, passing the data on to the next activity. We'll modify the onTutSelected() method later to decide whether or not to launch a new Activity instance or update the existing fragment instance. Now let’s move our attention to the TutViewerFragment class, which needs to be updated as well. Instead of querying the launch intent to find out which URL to load, the fragment will wait to be told what URL to load. In this way, we can update the WebView directly and not recreate the fragment with each load. At this point, the application behavior remains unchanged. The fragments, however, can now exist within the same Activity or separate ones without further code changes. This will divide the screen horizontally between both fragments. Now we can add some simple logic to the application to choose between launching a new activity (the two screen workflow) and updating an existing fragment (the one screen workflow). All this does is grab the fragment and check to see if it's part of the existing layout for the Activity. If not, the viewer activity is launched, otherwise the existing fragment is updated instead. At this point, the application will now function in two different modes: portrait is unchanged, while landscape displays the ListView to the left of the WebView. There are several improvements that could be made at this point, but they are of the tweaking, optimizing, and nit-picking variety and mostly for polish. For instance, if you are in portrait WebView mode and rotate the screen, the result is still just the WebView screen. You have to press back to get to the dual view. Polishing is beyond the scope of this tutorial, but you can see how, with the judicisious use of layouts and a little bit of activity logic, you can achieve powerful but flexible screen workflows for a variety of screens and devices. The Fragment API helps organize user interface components so that they can be reused across activities. In this way, an application can dynamically adjust its workflow and user interfaces with relatively little coding overhead. You've also seen that an application that builds upon fragments is easier to reorganize. Even better, just about any application can leverage fragments now that they are available via a compatibility library provided by Google that is compatible as far back as Android 1.6. Now go out and fragment your apps user interface and make awesome user interfaces for every screen size and shape! 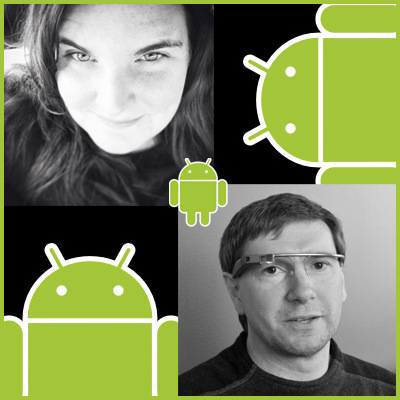 Mobile developers Lauren Darcey and Shane Conder have coauthored several books on Android development: an in-depth programming book entitled Android Wireless Application Development and Sams Teach Yourself Android Application Development in 24 Hours. When not writing, they spend their time developing mobile software at their company and providing consulting services. They can be reached at via email to androidwirelessdev+mt@gmail.com, via their blog at androidbook.blogspot.com, and on Twitter @androidwireless.